You can identify what song is this with the hum of a song using the song identifier apps, but if you want to know the lyrics of a song you need song lyrics apps. The best Karaoke apps for Android show the lyrics of songs to help you sing, but the number of songs in their database is questionable. Although, having a subscription to popular music services like Google Play Music and Apple Music, etc. show the lyrics of the song you are playing right on your screen, yet installing a dedicated song lyrics apps to know the lyrics of a song always helps. Listening to the tunes on the go is always a pleasant experience (it just mutes the noise), and you can travel to your destination with peace. There are music fanatics who grasp the lyrics of the song at the first time, and others don’t. Even professional singers cannot grasp the lyrics at once. In a nutshell, not everyone can remember the lyrics of a song, only some can. So, if there’s a need for you to sing a song but you do not know the lyrics of that specific song? At a party? Or at a casual hangout session? Professional karaoke session? Of course, you can’t carry a paper with you to refer the lyrics of a song you’ve got to perform. You need a quick solution to help you out anytime you want. Here, the song lyrics app would come to the rescue. Also Read: What are the Best Music Making Apps for Android? Simply, keep one of the best song lyrics apps for Android installed and utilize it whenever needed. 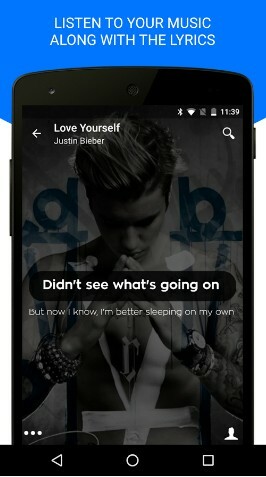 So, to help you along, we have compiled a list of best lyrics app for Android available at the Play Store. 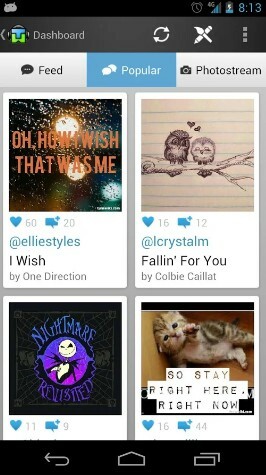 Musixmatch Lyrics is a quite popular song lyrics app. There are chances that you already have it installed. If that’s a yes, you can head for the alternatives mentioned as you read on. Musixmatch Lyrics offers an excellent user interface and a coupled user experience. Unlike ordinary lyrics apps for Android, it just does not help you find the lyrics of a song that you search for but also what you play. When you play a song with Spotify, it gives you the ability to read the lyrics while it’s playing. It just does not end with Spotify’s music streaming service, and it supports a whole lot of popular services like Google Play Music, Apple Music, and so on. You can also utilize your wearable or AndroidTV to have it displayed on them to refer the lyrics while you sing easily. Other features include translated lyrics and music identifying service as well. Lyricsmint is a quite popular lyrics web service in India. It houses a huge collection of Hindi song lyrics. It’s definitely a treasure to have installed on your Android device (considering you like Hindi songs or want to give them a try). You also get to save up to 150 lyrics which would be available for offline use. That’s definitely not a bummer because you don’t need to have note taking apps like Evernote installed to keep the lyrics available for offline use. 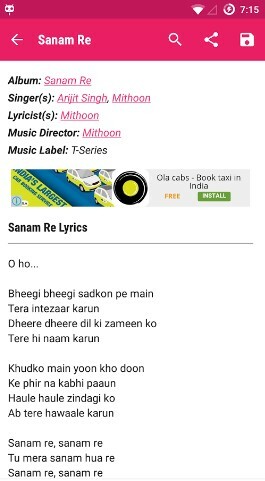 Along with Bollywood songs, Lyricsmint also offers plenty of non-film songs that you’ll be needing of. It also notifies you of the latest lyrics available on the song lyrics app. Lyrics Mania is one of the best lyrics apps for Android to have if you want a mixture of features and a minimal user experience. It gives you the ability to refer the lyrics in real-time while you play a song with Google Play Music. Well, that’s something you may find inconvenient at times (using two music apps). So, Lyricsmania comes with a music player integrated where you can play all of your favorite music tracks and refer to the lyrics without evening switching the app anytime. Similar to Musixmatch, it can help you identify music that you want to know about. You can even utilize this lyrics app to search for all the songs filtered by artist name. 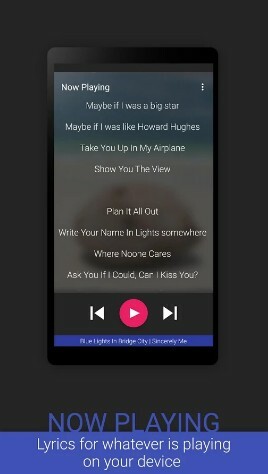 Lyrics is a dead simple Android lyrics app to fulfill your requirements to get most of the lyrics along with a perfect reading experience. It is also one of the best lyrics apps for Android that one can have. 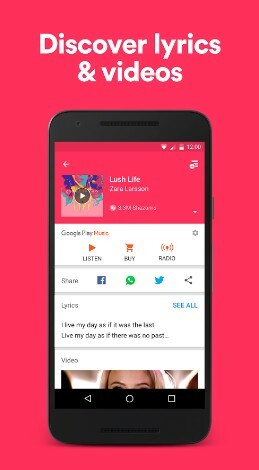 Similar to the other popular lyrics apps for Android, it also supports several Android music players to help you with real-time lyrics of a particular song that’s playing. It comes with native support for Rocket Player, GoneMad, and Android music. However, it does not feature the music recognition services (that’s the reason I referred to it as a dead simple app for lyrics). Also, it supports Chromecast. Shazam is primarily an app for music streaming service, not just something normal, but an incredibly popular service. It definitely comes to my mind when talking about the best lyrics apps for Andriod. Shazam incorporates music recognition technology as well. Being one of the popular music streaming services, it assures that you would get tons of music available. Also, it offers the lyrics to the song you’re playing as well. 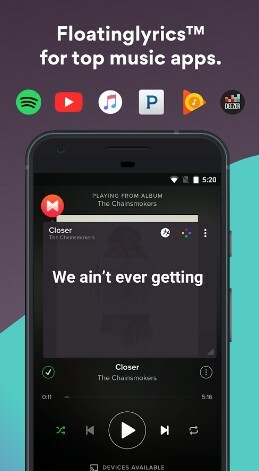 With this song lyrics app installed, you can say goodbye to the days when you utilized a separate streaming app and a dedicated song lyrics app for Android to fulfill the purpose. TuneWiki is a decent lyrics app for Android. Although it does not offer a great user experience but does the job, it is meant for. You can refer to the scrolling lyrics while a song plays. Even if it does not offer a great user experience, it surely gives you the ability to utilize SongID feature to recognize the music playing nearby. Unlike other lyrics apps for Android, TuneWiki might annoy you with the in-app advertisements, but its instant translation (up to 40 languages) feature may hold you back from uninstalling it. Lyrically stands as one of the best lyrics apps for Android. If you were looking for something with a decent user interface, but without any fancy features (just letting you read the lyrics of a song), Lyrically is a perfect app for lyrics. As an additional feature, it supports several music players to help you with the real-time lyrics. There’s nothing more to it. Wikia.com powers Lyrically. So, you’ll observe a lot of contributors for it, and it may assure faster lyrics availability than the big dogs mentioned above. Also Read: Music Paradise Pro Downloader: Is It Best MP3 Music Downloader for Android? Surely there are several song lyrics apps for Android, available at the Play Store. 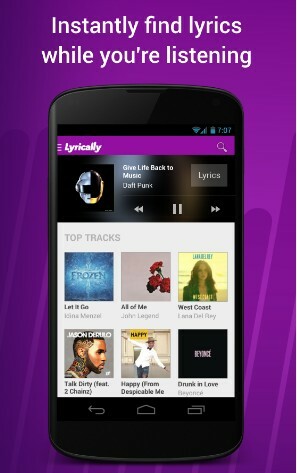 But, here, we have presented you with the list of best lyrics app for Android. You may consider any of the app mentioned above for lyrics according to what you need. If you want an all-in-one kind of song lyrics app that plays music or is packed with features, then Musixmatch and Shazam would do the work. Looking for simpler alternatives, then TunesWikia and Lyrically would do the trick. If you are fond of Bollywood music, you’ll find Lyricsmint to be the best you could ever have. And, other applications mentioned offer a mixed combination of features and quality. You be the judge to decide whether you should give them a try or not. Which one do you prefer to use? Do you happen to know about a lyrics app that beats them all?Let us know your thoughts in the comments section. What are the Best Free MP3 Music Tag Editors for Android to Modify Music Tags? What are the Best Free Music Downloader Apps for iPhone and iPad Users? How to Boost Sound Quality on Android using Best Equalizer Sound Booster Apps for Android? What are the Best Music Downloader Apps for Android for Free Music Downloads? What are the Best Internet Radio Services to Listen Radio Online?